I got a beautiful book for my birthday called Culina Mediterranea, the book must weight about 10 lb, is 4 inches thick, I can only read the book if it’s laying on a table, it’s too heavy to carry and impossible to be reading it in bed. This pavé (=rock) gathers the best recipes from some top chefs in the Mediterranean countries, such as Southern France, Italy, Spain, Greece, Marocco. There is not one recipe to throw away, they’re all so inviting, creative and delicious. I simply love that book, so from now on, I will dig maybe once every two weeks a recipe and just post it. This one is a recipe from Alain Carro who is a restaurateur in Provence. Do you know Alain Carro? Probably not, not sure he is famous in the US, but he is in France. He is not as popular as Alain Ducasse, Paul Bocuse or Joël Robuchon, but he still managed to get one star at the Michelin for his restaurant Le Castellaras located in Fayence. He himself got inspired for this dish by the creation of another famous chef Roger Vergé who lives close to Cannes. 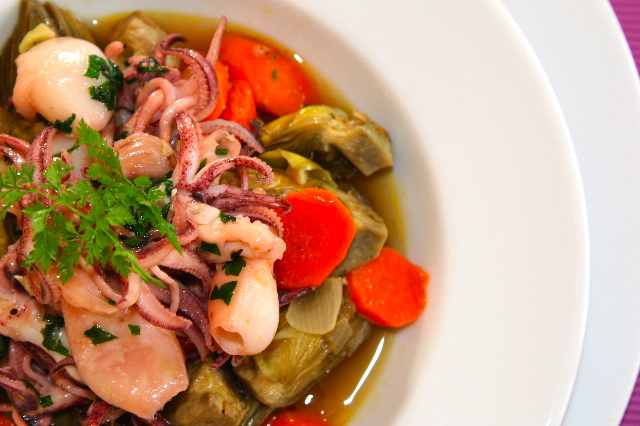 I loved that recipe right away, I get tired of stuffed squid with crumbs, garlic and parsley, and this one was very appealing, the combination of artichokes, Pastis, white wine and squid convinced me to make it, and I knew it would be delicious. I don’t know about you, but most of the time, I know right away if I will like the recipe or not. I did not change anything to the recipe other than I used only olive oil instead of a combination of butter and olive oil. I am giving you the original recipe, you can substitute the butter with olive oil if you wish. Pastis adds a wonderful final touch of anis/fennel taste, and who can complain about the quantity of garlic? Certainly not me. 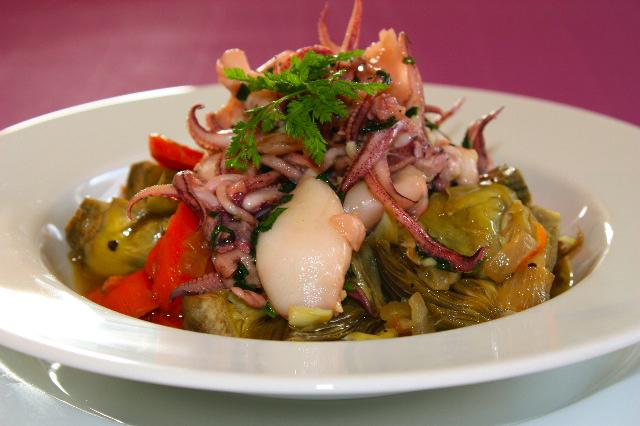 Squid remains a very popular dish in Mediterranean regions, and easy to prepare. My favorite part are the tentacles, they always remain a little hard on the bite but I love their texture. Artichokes we have in France are called “poivrade” and we eat the stem too, the are elongated and a little more purple that Californian artichokes. This dish has all the ingredients and flavors of Provencale cuisine. So if you want to take a trip to Provence, just start here. Start with trimming the artichokes, remove the hard part, and the top of the leaves. Place artichokes in water with lemon juice to prevent them from discoloring. Heat butter and olive oil in a pan, add squid for 1-2 minutes until firm and the water evaporated. Set aside. Heat olive oil in a skillet, add carrots, onions, garlic and bouquet garni (mixture of herbs, such as thyme, marjoram, parsley, etc…). Saute all the vegetables and bouquet garni for a few minutes, add salt and pepper. Drain artichokes and add them to the pan of vegetables. Saute until the vegetables are golden brown. Sweat the vegetables on low heat for 15 minutes. Deglaze the skillet with the white wine, and saute the vegetables for 5 minutes. Add bouillon cube and stir until it has dissolved. Mix butter with parsley and garlic, add pastis. Add this mixture to the squid. Deglaze the pan with pastis. Season with salt and pepper and arrange in a plate, garnish with some chervil. This entry was posted by silvia on December 4, 2009 at 6:04 pm, and is filed under Appetizers, Fish/Seafood. Follow any responses to this post through RSS 2.0.You can leave a response or trackback from your own site. i don’t know nothing about alain caro…but this recipe is gorgeous,silvia,and you are amazing powers to give the life and beauty of every made recipe! This is my kind of dish. I love all the flavors in here. I didn’t know Alain Carro, mais je le connais maitenant, merci! This looks so beautiful and healthy and light, but satisfying. What a delightful combination of flavors! This is one I certainly have to try. Merci beaucoup! Hi!! Just found this post while trying to find Culina Mediterranea online. Is there an eggplant and feta roll recipe in it? I’ve been trying to find a copy of the recipe, and I bought the new 2012 edition of Culina Mediterranea but it’s not in there!! Before I go out and buy the 2008 edition online somewhere I’m trying to find out if that recipe is actually in there. I would be so grateful if you’d be able to have a look and let me know please.